Tradition plays a very important role in any wedding and in an actual royal wedding, it becomes the mainstay of celebration and ceremony. What made the wedding of Meghan Markle to Prince Harry special though, was not the fact that tradition was deviated from - but rather, new traditions were gently put in place to welcome and accommodate the new ideas of the next generation of royals and the new cultures brought in. Sparks of novelty glittered through the ceremony - the sermon, the choir, the dress, the invitees and yes, the cake! Claire Ptak California raised, London based pâtissière and owner of Violet Cakes was entrusted with creating the wedding cake. She knew Meghan Markle from a previous interaction when Meghan interviewed her for her blog The Tig. According to the Kensington Palace Twitter account, Ptak "focuses on using seasonal and organic ingredients in her cakes." And the cake was as much of a gentle statement in alignment with the rest of the wedding aesthetic. 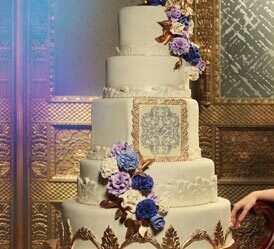 Unlike the towering tiers of royal wedding cakes past, this one was split into three parts, each of a different size and placed upon golden platforms at varying heights. 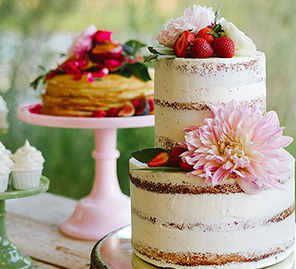 The rustic finish was created using Swiss meringue buttercream and topped with 150 fresh flowers - mainly British, and in season, including peonies and roses. Made to deliver a quintessentially British spring flavor, the sweet stunner tied together the brightness of Amalfi lemon curd and elderflower buttercream, sandwiched between the layers. A special detail was the elderflower syrup which was made at The Queen's residence in Sandringham from the estate's own elderflower trees! The light sponge cake was uniquely formulated for the couple and was truly remarkable. Despite being very British, the flavor though was another departure from wedding tradition. 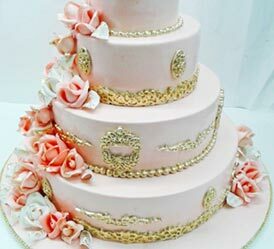 Usually, British wedding cakes are made in a Christmas-fruitcake style, which is meant to last long enough to be served at the couple's first child's christening. The lemon elderflower cake would not necessarily be used in the future. 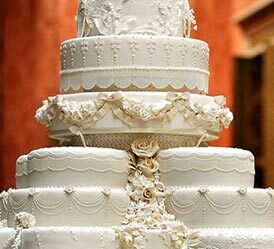 The cake may have been created only to serve the 600 royal wedding guests, but its details sure have managed to feed the imaginations of numerous royal watchers, the world over!